Ian Wallace has traveled across the country examining skeletons in the basements of museums and in the backroom closets of medical institutes. He’s seen 2,576 of them, to be exact, driven by an interest in just one thing: their knees. One-fifth of the U. S. population suffers from knee osteoarthritis (OA), a painful and debilitating disease caused by the femur grinding against the tibia. But Wallace, a postdoctoral fellow in human evolutionary biology, and his adviser, Lerner professor of biological sciences Daniel Lieberman, wondered if OA had always been so common. 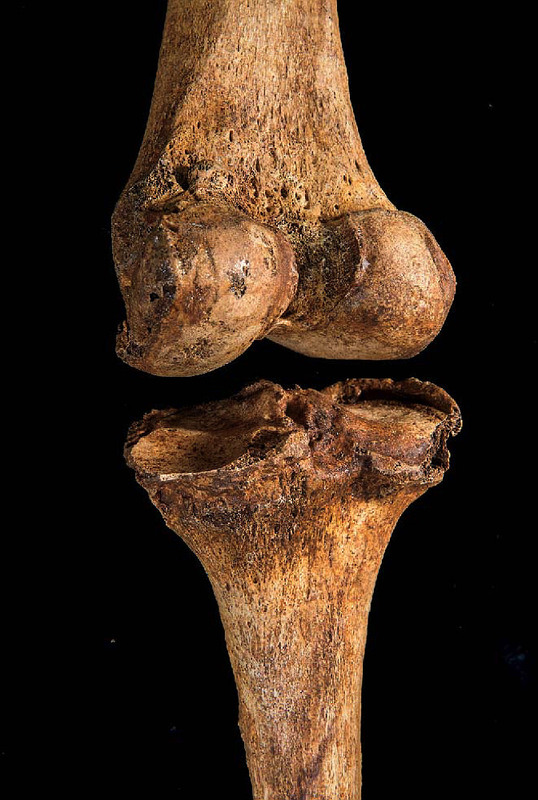 Although clinicians who treat the disease have noted an increase in the number of cases, which now typically end with knee replacement, no one had tried to quantify the prevalence of the disease across centuries. The two researchers realized they could study this public-health problem using an approach dubbed “paleo-epidemiology.” The bone-on-bone rubbing that occurs at the end stage of the disease, when all the cartilage is gone, leaves a glass-like polish on bone surfaces that is unmistakable, Wallace explains. It’s unambiguous and easy to measure accurately, and is what he was looking for in the skeletons he studied. But the magnitude of what he found was unexpected. By comparing skeletal evidence from the prehistoric and industrial eras to that from the postindustrial era, and carefully controlling for differences in the way the skeletons from the various periods were collected, Lieberman and Wallace found that the prevalence of the disease had more than doubled since World War II. The common belief, he explains, is that knee osteoarthritis is unpreventable. Clinicians who treat OA typically cite cumulative wear and tear on the knee joint as a principal cause of the disease. As people, on average, live longer and weigh more than in the past, the thinking goes, the prevalence of OA naturally increases. But the new research shows this is wrong. By controlling for factors such as age and body mass index (BMI)—matching physically and demographically similar individuals across the industrial and post-industrial eras—the researchers were able to eliminate both increased longevity and obesity as causes of the spike they discovered. That doesn’t mean obesity is not a factor: “It can increase your risk of osteoarthritis considerably,” explains Wallace. But obesity can’t explain the recent, sudden spread of the disease. After controlling for gender, ethnicity, and body mass index, the data clearly show an increased prevalence of knee osteoarthritis in post-industrial populations at all ages. The level of OA didn’t shift, essentially, for thousands of years, Lieberman points out, among either prehistoric Native American hunter-gatherers and farmers, or industrial-era workers. The spike came suddenly, in the postindustrial period, and the pattern of injury changed, as well. Lieberman and Wallace don’t know what that “something” might be, but are testing the hypothesis that physical inactivity, which increased with the mid-twentieth-century shift to service-sector employment in the American economy, is an important factor. That theory might seem counterintuitive for a disease thought to be caused by wear and tear, but some potential mechanisms by which exercise protects joints are known: physical activity promotes the growth of hydrophilic proteins that store water and thus lubricate joints, Lieberman notes, and there is evidence that within cartilage, such activity affects the production and turnover of collagen. (Exercised animals, for example, have more cartilage in their joints, older data show.) Furthermore, exercise strengthens muscles, protecting joints from overloading at moments of strain, and also lowers inflammation. To test this, Lieberman and Wallace are currently running a controlled experiment in the lab with guinea pigs, comparing rates of OA between active and inactive animals.